It was just another spring day in Lancaster County, the odor of manure seeped through the cracks in the window, a familiar smell to Penn Manor students. Seniors Jake Shiner and Sam Valentin surfed the web for their next story. Adviser Susan Baldrige, sensed the students were looking for something to do. She had noticed an interesting man in the library and sent her journalists on the trail. As Shiner and Valentin strolled out to the library they were wary of what they might encounter, their teacher had sent them out on several lame stories in the past. This might another. What they encountered was the sports story of the year in Pennsylvania. “Mr Funk was in the library looking in old yearbooks for people for his softball league,” said Shiner. “The story came from there,” added Shiner. 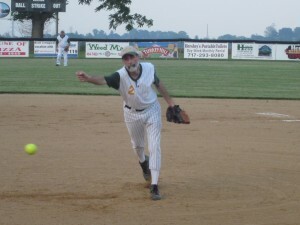 The extremely unique story delves deep inside the inner -workings of a senior softball league. They highlighted that no matter the age, for some, the passion for the game is never extinguished. “It’s kind of a feel good story because these old timers are playing the game they love,” explained Valentin. “They don’t want to believe they’re not young anymore,”added Shiner. Valentin and Shiner came in first place in the Pennsylvania Newspaper Association competition in the sports story category. It was announced this week and the actual award ceremony will be held in Hershey March 14. The students were not surprised by how well their story has been received. They had already won another state-wide award for sportswriting for their story. “We were really confident because Mrs B. told us it was a really good story and we thought it was too. We had already won the Pennsylvania School Press Association award for it so this was kind of expected,” said Valentin. Even with these accolades the journalists feel the story could have won even more. “It’s a good feeling (winning the award), but I think we could have won a national award,” said Valentin. Fellow Penn Manor students Sarah Schaeffer and Bryan Hess took home first place in the feature story category for her story about juveniles in Pennsylvania who have been tried as adults. Schaeffer’s story ended up winning the national award for best feature story, the coveted Brasler Award. The catch is that at the state level Valentin and Shiner’s story received a higher score than Schaeffer’s. “Her story was really good. It’s just kind of disappointing that we didn’t get recognized at the national level,” stated Valentin. Baldrige has fond memories of the story that won’t soon be forgotten. “My favorite day in journalism was the day we edited that story,” said Baldrige. She explained that they were just bouncing ideas off each other of what should go where and things like that. By the time they were finished they had created a 1300-word masterpiece. Outlining this incredible league of old timers just having fun, filled with pictures and their remembered times of glory. Shiner offered his final reflections on the story.